St. Pancras Station and Midland Grand Hotel, London. Architect: Sir George Gilbert Scott. 1868-77. Photograph by Robert Freidus. Formatting, perspective correction and text by George P. Landow. You may use this image without prior permission for any scholarly or educational purpose as long as you (1) credit the photographer and (2) link your document to this URL in a web document or cite the Victorian Web in a print one. 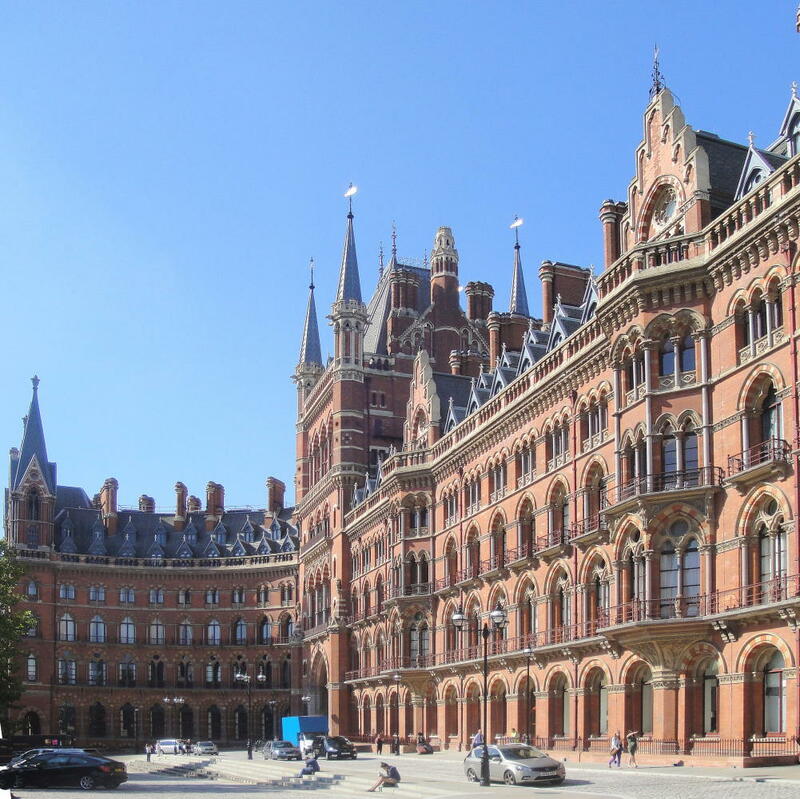 St. Pancras,the terminus of the Midland Railway, is, with the exception of the Gt. Eastern terminus at Liverpool-st, the largest and handsomest railway-station in England. It is built of iron and glass, in a single span. The girders of the roof do not, as in most cases, extend from side to side, supported by abut. ments at either end, like the girders of an ordinary house, but spring straight from the groupd, in pairs from either side of the building, the upper ends curving over, and meeting in the middle. Each girder is broad at the base, tapering gradually as it bends over to meet its fellow, and the whole station is thus simply a vast roof springing directly from the ground, the brick walls at the side being in fact mere screens of no structural value in the way of support. This peculiar form of girder, giving the arch of the roof a somewhat pointed instead of the usual rounded contour, has a quaintly Gothic effect, which harmonises well with the gorgeous architecture of the huge hotel . . . which forms the Euston-rd façade of the structure. The station entrance for cabs and carriages is on the west side of the station from Euston-rd, whence also on the east side a subway for foot passengers only leads at a sharp incline up to the end platform, connecting the departure with the arrival side. The booking offices are all on the west side, opening direct from the carriageway. NEAREST Ry. Stns., King's + (Met. & G. N.) -- Omnibus Rte., Euston-rd; CabFares, to Bank, 1/6; to Charing +, 1/. -- Dickens's Dictionary of London 1888, pp. 220-21. "Matching his ability to think and design on a cathedral scale was Scott's capacity for complex planing in his secular commissions. Althoough his gothic Foreign Office proved abortive, he rivalled its conception with the Midland Grand Hotel (1868-77) for London's St. Pancras Station. Red brick, with terracotta and buff yellow stone, it spectactularly unites thirteenth-century French gothic with the latest iron construction, the asymmetrical elevations sweeping round to the grant entrance at one end, and pivoting brilliantly on the clock tower at the other." -- Brooks, pp. 334-35. Brooks, Chris. The Gothic Revival. London: Phaidon, 1999.